"You people don't need to know that I paid no taxes..."
Mitt Romney has caused a bit of a stir with his taxes. He won't follow in his father's precedent-setting foot steps and has decided to only release two years of tax filings. This has caused pretty much everyone, from Democrat to Republican, to call for Romney to release more. After all, it looked bad enough when it was revealed that Romney pays a lower tax rate than most Americans. Now, another piece has moved into the Romney tax puzzle - Senate Majority Leader Harry Reid has claimed to have talked to a person formerly associated with Bain and that person claimed that Romney had not paid taxes for ten years. "Harry, he didn't pay any taxes for 10 years," Reid recounted the person as saying. "He didn't pay taxes for 10 years! Now, do I know that that's true? Well, I'm not certain," said Reid. "But obviously he can't release those tax returns. How would it look? What was the Romney campaign's response to such accusations? Did they deny it outright? Did they reveal anything that could dispel such rumors? Romney's campaign adviser Kevin Madden said his candidate had "gone above and beyond the disclosure requirements by releasing two years of personal tax returns in addition to the hundreds of pages of personal financial disclosure documents he has provided to the FEC and made public." Harry Reid has not backed and stood by his original comments. Mitt Romney responded by running to Sean Hannity's radio program a couple days later to talk tough and return to his typical attack- Democrats are trying to change the subject from the economy (even though revealing Romney's low tax rate - or none at all - would highlight how the tax code disproportionately favors the wealthy). "Well, it's time for Harry to put up or shut up. Harry's going to have to describe who it is he spoke with because of course, that's totally and completely wrong," Romney told Hannity in a radio interview. "It's untrue, dishonest, and inaccurate. It's wrong. So I'm looking forward to have Harry reveal his sources and we'll probably find out it's the White House. Look, the Obama campaign is going to do everything in its power to try and talk about anything besides the president's record. Home prices, median American incomes, gasoline prices, 23 million underemployed or unemployed. "They don't want to talk about that or his promises, cutting the deficit in half, cutting the medical insurance rates that people pay," Romney added. "These are all the things he promised. He can't talk about that, so they try and put this kind of baloney out there, and the people could smell it for what it is, and it's not a pretty smell." So Romney believes that Reid's latest comments are coming directly from the president because the Obama campaign doesn't want to talk about the economy, which is ridiculous considering that is all anyone is talking about. Basically, to combat a claim that Romney is not being transparent and truthful Romney claims Reid is not being transparent and truthful, asking Reid to "put up or shut up," and then makes the baseless claim that the White House is behind this attack. Talk about double standards. Why doesn't Romney have to "put up or shut up?" There is a controversy because the Republican presidential nominee, Governor Mitt Romney, refuses to release his tax returns. As I said before, I was told by an extremely credible source that Romney has not paid taxes for ten years. People who make as much money as Mitt Romney have many tricks at their disposal to avoid paying taxes. We already know that Romney has exploited many of these loopholes, stashing his money in secret, overseas accounts in places like Switzerland and the Cayman Islands. Last weekend, Governor Romney promised that he would check his tax returns and let the American people know whether he ever paid a rate lower than 13.9 percent. One day later, his campaign raced to say he had no intention of putting out any further information. When it comes to answering the legitimate questions the American people have about whether he avoided paying his fair share in taxes or why he opened a Swiss bank account, Romney has shut up. But as a presidential candidate, it’s his obligation to put up, and release several years’ worth of tax returns just like nominees of both parties have done for decades. 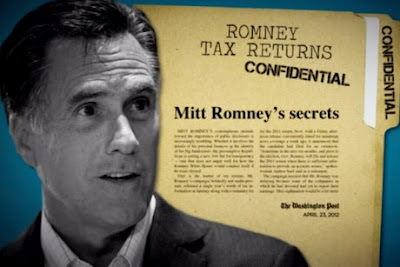 It’s clear Romney is hiding something, and the American people deserve to know what it is. Whatever Romney’s hiding probably speaks volumes about how he would approach issues that directly impact middle-class families, like tax reform and the economy. When you are running for president, you should be an open book. I understand Romney is concerned that many people, Democrats and Republicans, have been calling on him to release his tax returns. He has so far refused. There is only one thing he can do to clear this up, and that’s release his tax returns. Considering the facts that we know about Romney, such as use of tax shelters, low tax rates, and unwillingness to provide what has been the standard since his father ran for the presidency, it doesn't look good for Romney. Now what happens if this Bain source steps forward? What would Romney do then? All of this could settled if Romney were to just release his records. I am not sure why Romney is so reluctant, especially when he released ten times as many tax returns to the McCain campaign. Mitt Romney: "I Am Not A Business!"